UPDATE: Following publication of this story, the Board of Estimates deferred action on the cost overruns described below. A spokesman for BOE President Bernard C. “Jack” Young denied there was any connection between the article and the deferral, saying Young sent an email yesterday asking DOT for a meeting on the overruns. The price of “streetscaping” a short segment of East North Avenue has jumped to nearly $15 million thanks to a raft of extra work orders (EWOs). But consider the bright side, the city Department of Transportation is telling the Board of Estimates today – the contractor actually wanted $455,386.72 more. According to DOT, “final negotiations” with construction giant Allan Myers reduced one of the eight cost overruns so far generated by the half-mile reconstruction project. Still, Mayor Catherine Pugh and the spending board will be asked this morning to approve nearly $1 million in extra costs to Myers. That’s on top of $722,000 previously awarded by the board to the contractor, who is also building the much-delayed Connector Bridge linking Harbor Point to Central Avenue in Fells Point. The last cost overrun was approved by the board (with “yes” votes by Council President Jack Young and Mayor Pugh) at the November 22 meeting. DOT blamed “unforeseen conditions” for the jump in costs for the North Avenue Streetscape project. Among them was the discovery of streetcar tracks buried under the existing pavement and “lost” utility vaults and water lines – some leaking, others with inoperable turn-off valves – not disclosed in construction drawings. DOT also approved several changes that lessened the impact of reconstruction on traffic and local institutions but raised the cost of labor. 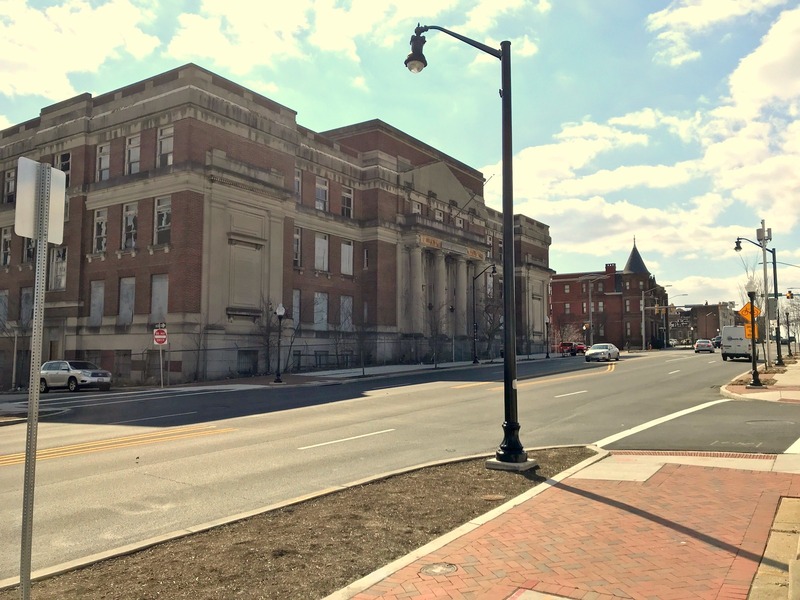 They included nighttime repaving and weekend work to demolish and replace the sidewalk around the Eastern District Court building at North Avenue and Harford Road. The freshly-laid brick pavers, recessed parking spaces, curb bump-outs, antique streetlights, and tree and flower plantings form a stark contrast to the boarded-up houses and vacant lots that line the thoroughfare. 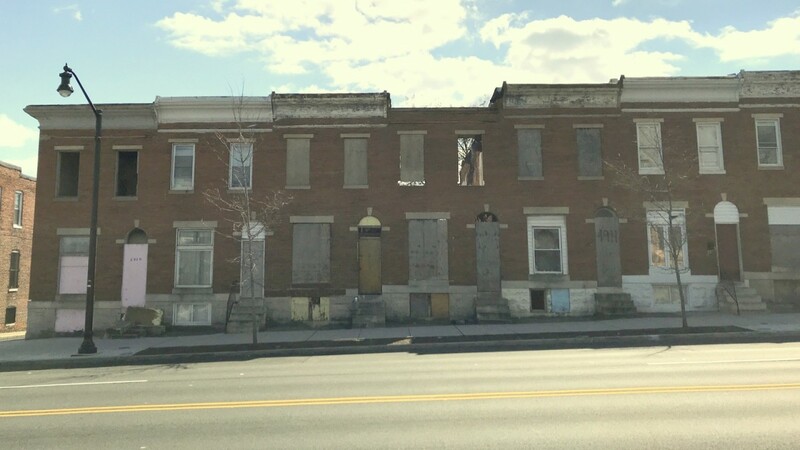 The National Great Blacks in Wax Museum is trying to fill a large vacant lot on the 1600 block of East North Avenue with a $75 million building that has yet to get off the ground. A block to the east, the city-owned Ashley Apartments sits in the shell of an abandoned school house. The imposing neoclassical building has been vacant for 25 years after developers defaulted on a federally insured loan. 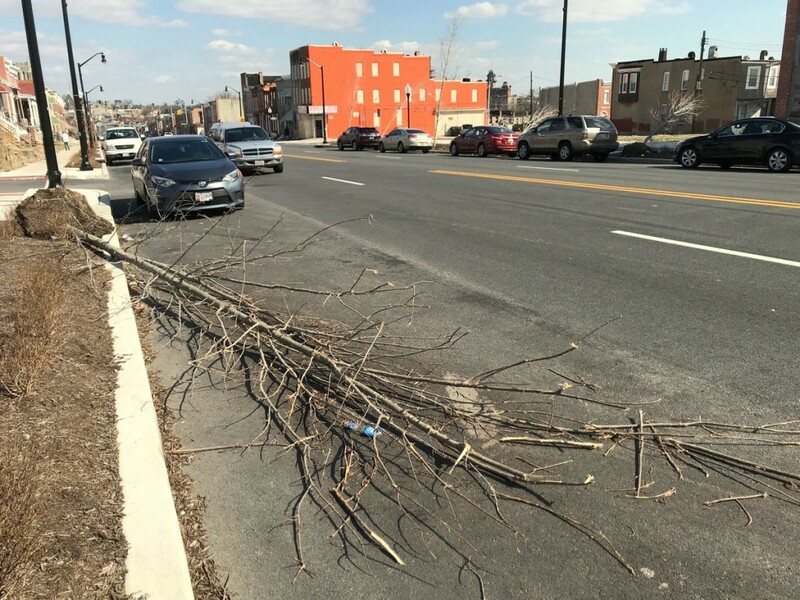 Down the street, saplings planted along empty lots as part of the repaving project have already been uprooted, apparently from recent windstorms. 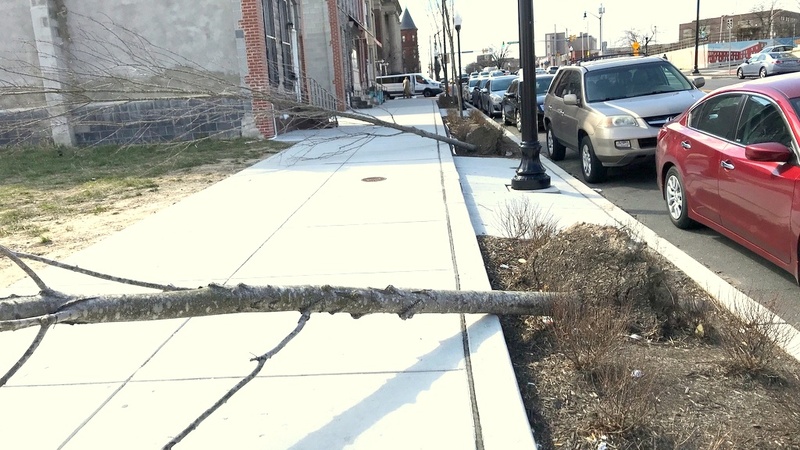 Several of the trees hung over the sidewalk yesterday, and one lay flat on the street, its branches pulverized by car traffic. Given the amount of debris accumulated in and around the holes, the trees appear to have been left unattended for weeks. 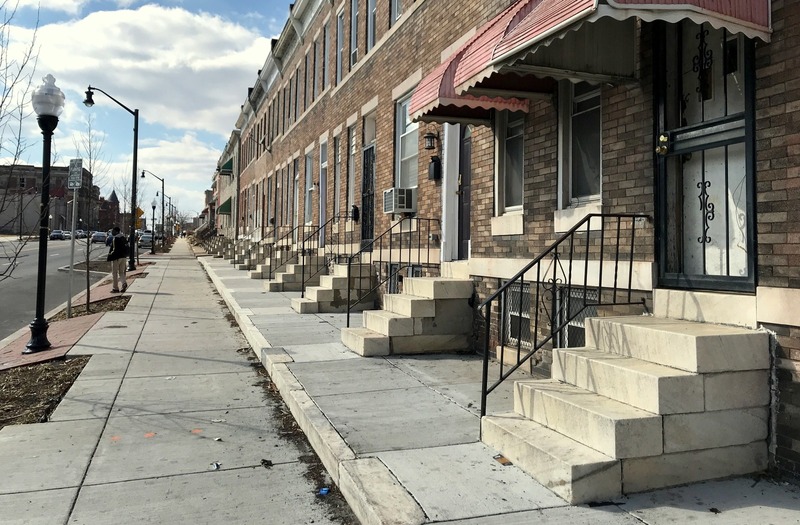 Funding for the streetscape project comes out of Baltimore’s allotment of federal highway grants for rebuilding its roads, bridges and viaducts. Repairs on many structures identified as deficient – such as the Maisel Street Pedestrian Bridge in Westport, Sisson Street Bridge over CSX and Harford Road Bridge over Herring Run – have been delayed for decades due to DOT’s claim of insufficient funding. Saplings uprooted (above) in the 1700 block of East North Avenue and partly crushed by cars (below).